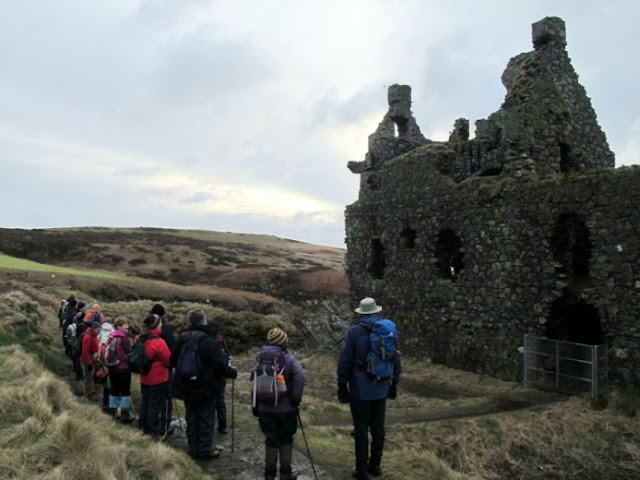 A cold but dry day ensured that 19 members gathered at Portpatrick car park for a leisurely walk along the cliffs to Knockinaam. When Cath, Frances, Isobel, Elaine, Allan, Mike (not seen him for ages), Debi, Andrea, Richard, Mary, Audrey, Irene, Heather and her husband, Andy, Linda (walked down from her home at Dunskey Park), Leslie (had caught the bus from Lochans and met up with Linda), Allan Topping, Margaret and Sue – not seen her for ages either - there were lots of hugs and belated ‘Happy New Year’s before we set off. My ‘pep’ talk was short and my leadership skills were almost non- existent! Those who of us who could, made their way quickly up the very MANY steps away from Portpatrick and then the rest of us caught up when possible! 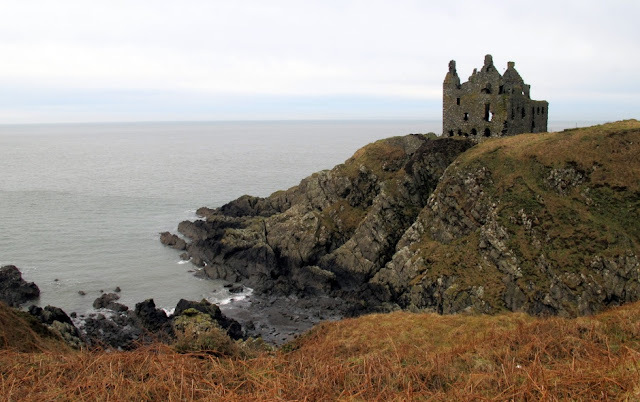 Steep steps up to Dunskey castle meant that there was plenty of time to enjoy the views - the more southerly coastline stood out starkly against a pale sea, Ireland was a smudge on the horizon, and the sea sparkled, a great expanse of cool blue. Jim was not with us today so I used my responsibility of main photographer (I noticed Irene using her camera) to weave back and forth between the group to try to get some suitable photos for the paper - that was my excuse anyway for not always (hardly ever) being at the front of the walkers, most of whom had done the walk at least a couple of times before. We were so lucky with the weather after a couple of days of sleet, snow and rain as the day was dry if not always bright. There was some watery sunshine, the sun never quite making a stronger appearance. A short stop was made at the castle. The original building here dated from the fifteenth century but the remains to be seen today are from the enlargement of the tower house around 1620. Unfortunately now the ruins are considered too dangerous to explore. The new coast path is a great improvement, with kissing gates and bridges easing the way, but mud was still a constant companion this day. 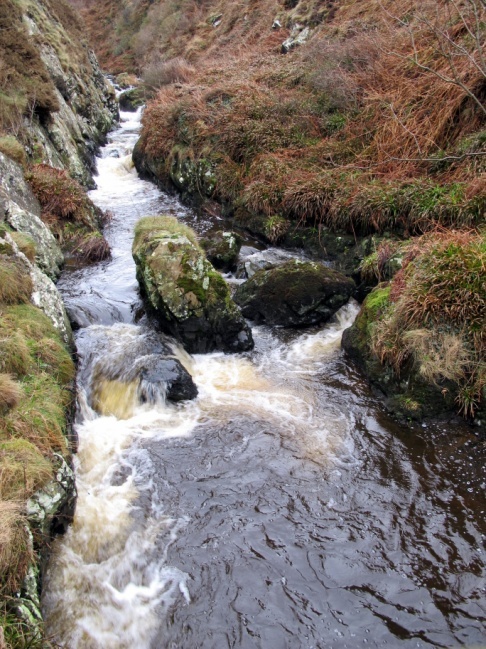 However, there is a good stretch of track where once there used to be a very slippery section after crossing the bridge over Craigoch Burn. Soon Morrach Bay, with a small cottage centred on a wide flat stretch of grass, was seen below. In the recent past early potatoes were grown on this small field, but today the cottage is a holiday let, approached by a treacherously steep and winding track from the top of the cliffs. A sweetie stop was called for, as the notice, listing the numerous dangers of the approach to the shore, was read. As Florence and I had been unable to do the planned recce owing to the inclement weather, it had been decided that we would follow the usual route down to Port of Spittal Bay but, having gone through the last kissing gate, Leslie got over the electric fence on our right, saying that this was the way that HE goes. 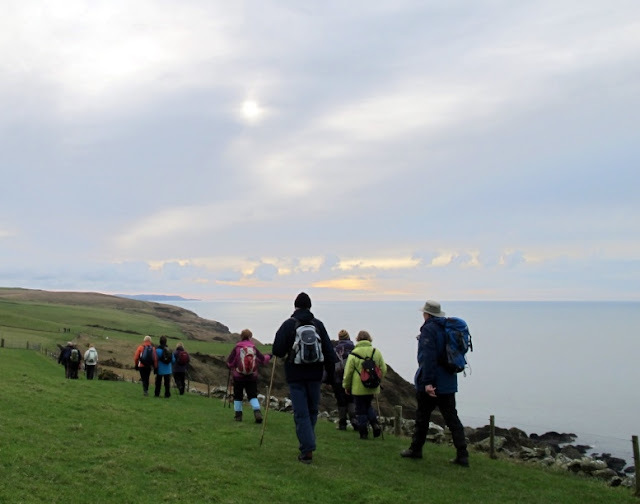 The walkers were told that if they wanted adventure they were to follow Leslie, if they wanted to follow the known track they could go straight down (muddy and slippery) and turn right to follow the road down to the bay. The complete party went for adventure and it was much better going down this way and being rewarded for our effort with an early lunch as we got to the bay about 11.45am. 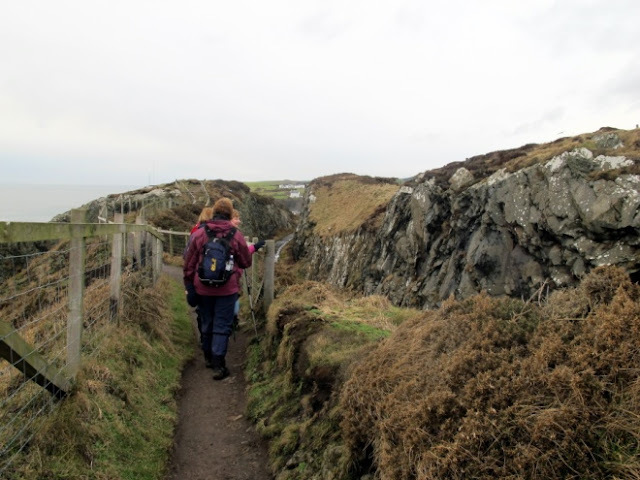 The walk now took a new route to Knockinaam and Port o’Spittal Bay, but confusingly, an electric fence had to be crossed to link the cliff path and the kissing gate at the top. 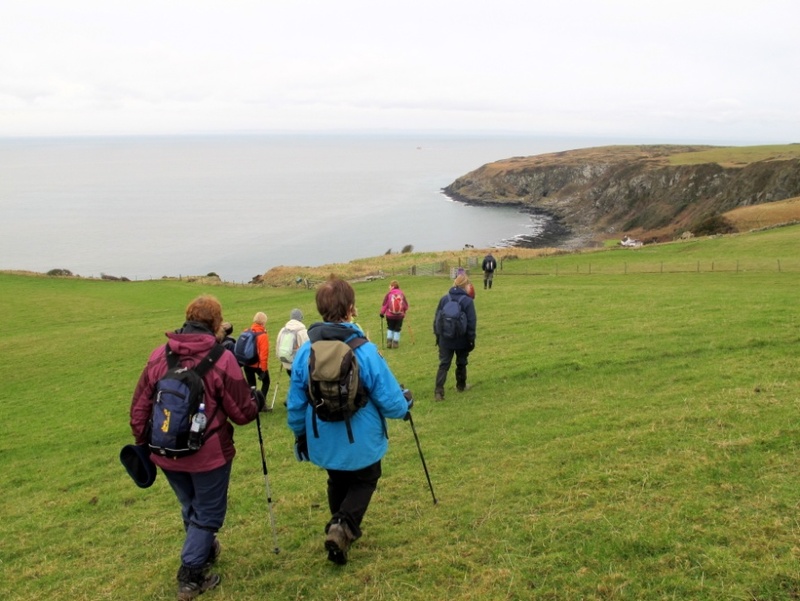 The way was steep and slippery, but all reached the rocky outcrop in the sandy bay below with little difficulty, and settled down to an early lunch. Diving shags were the only sign of life in this quiet sheltered inlet. 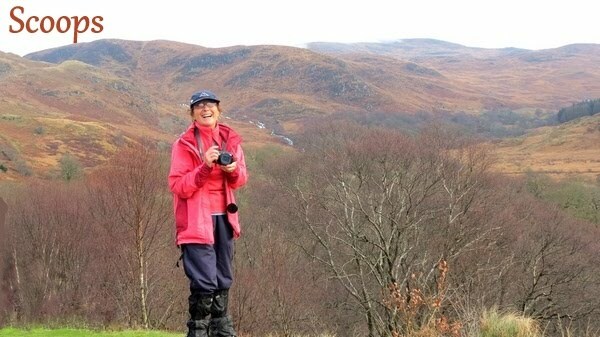 The return has always been to walk up the road and to follow the road for quite a long way, which is quite good, but I wanted to retrace our steps UP the hill and find out if there was a better way of accessing the track without going over the electric fence (sorry Andrea!). We did go up a bit further but still had to get over a fence, this one made safer with some rubber tubing. The path to the top of the cliffs now had to be renegotiated and views to the north were then enjoyed as the outward route was retraced. Soon a grassy track was followed away from the cliffs where a flock of black Zwartble sheep kept well away as the walkers crossed the field. 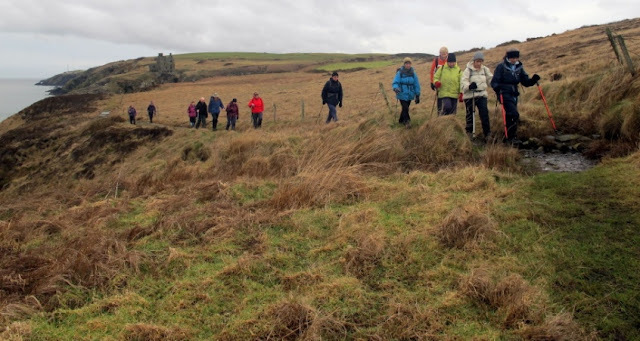 The ramblers emerged onto a country road by ‘Eagle’s view’ and stopped to hear about the wartime buildings here, now being used for cattle shelter and storage. Locally known as ‘Hush Hush’, they were an early outpost for radar, tracking submarines and shipping in the North Channel. 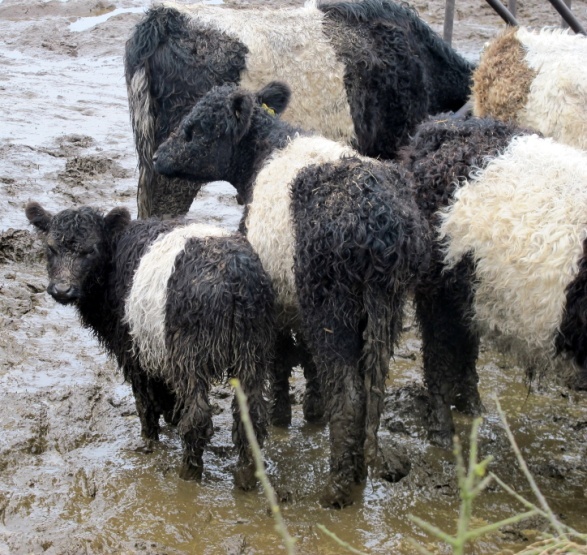 A herd of Belted Galloways were admired with young calves and their mothers gathered around a feeding station, their feet encased in wet mud, the little ones looking so cute with their extremely thick and curly coats. 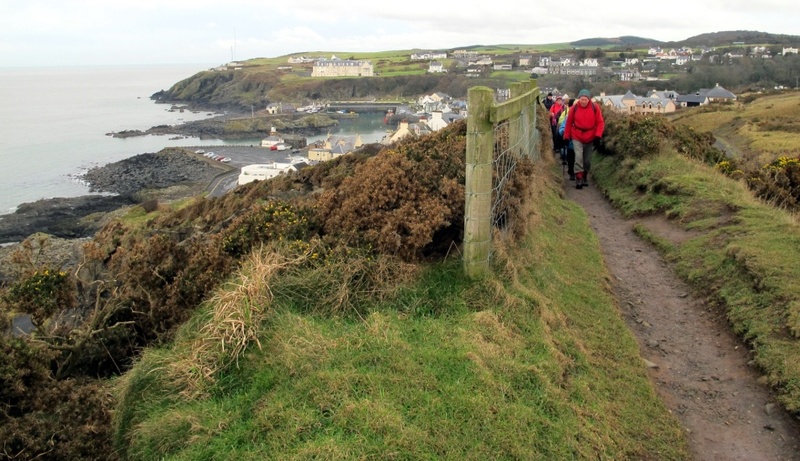 Further along the road the group heard about the early hydroelectric scheme which supplied Portpatrick with power. 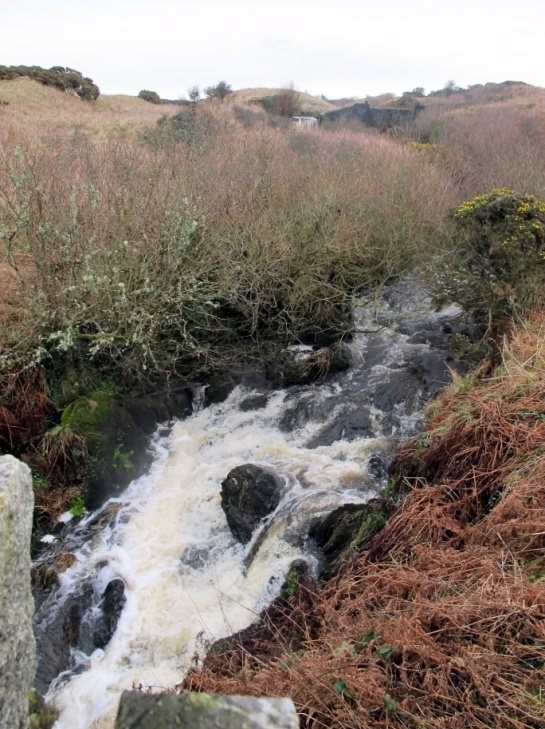 The dam, which can be seen from the road, is now breached and an impressive waterfall, enlarged by recent rain, thundered over the lip. A path beneath the former railway line led up onto the disused track and through the caravan site, which is in the process of being expanded. Good paths have been laid for sites with wonderful panoramic views across the sea. 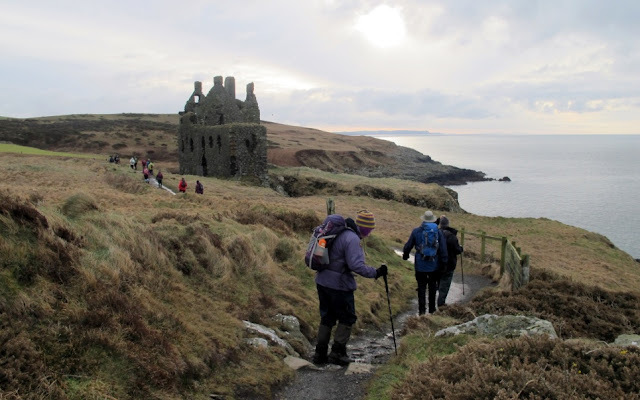 The way back to the cars now passed Dunskey castle once again, followed by an easy descent of the steps alongside the disused railway cutting. As one of the bridges was crossed the ramblers stopped to watch fulmars billing and cooing, staking claim to desirable ledges for nesting sites. 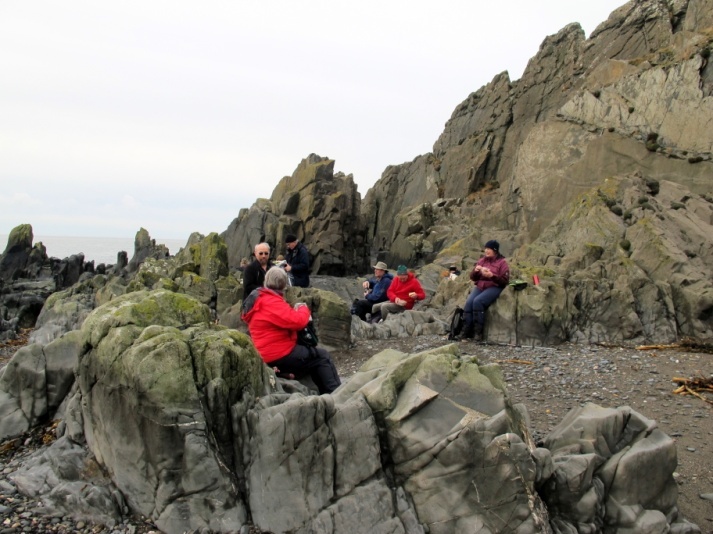 The walk finished with refreshments at the Beachcomber where the company enjoyed a calorific reward for their exertions. Allan Leiper, Debi and Mike opted to return to Stranraer and home, leaving the rest of us to go over to the Beachcomber where Derek was already sitting, enjoying his scone and coffee. There were so many of us ordering and paying before the owner of the cafe (whom I had phoned yesterday to make sure the place was open AND that there would be enough scones) could start to bring our refreshments to us. 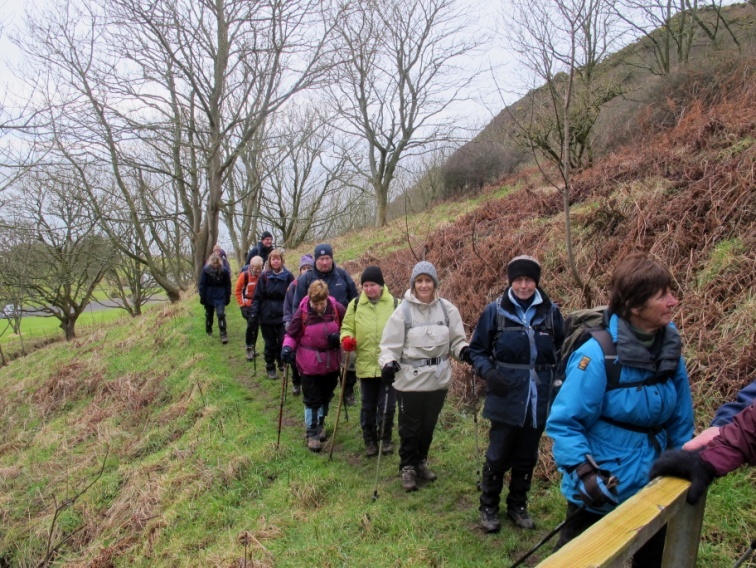 However, we had finished the walk in good time and none of us was in a rush so the delay was only frustrating to the last of the party to arrive – Jacqui and Mary who had joined us after doing the walk in reverse!